Rafa Benitez says there’s NO panic at Newcastle United after the club lost top spot in the Championship. Benitez’s side trail league leaders Brighton and Hove Albion by two points after losing two of their last three games. Newcastle take a break from the league today with an FA Cup third round tie against Birmingham City. Benitez is confident his team can quickly put Monday’s frustrating defeat to Blackburn Rovers behind them at St Andrew’s ahead of a Championship fixture against Brentford on Monday week. And the Magpies’ manager is adamant that he has NOT been concerned with recent performances, with the exception of the poor showing against Sheffield Wednesday in the 1-0 defeat at St James’s Park on Boxing Day. 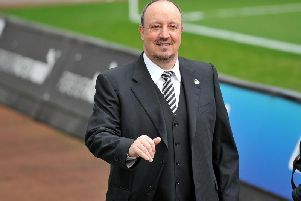 “From day one, we have done lots of things, and everybody was very happy was that,” said Benitez. “We have to keep doing that, because obviously we have been good. You can criticise the results, yes, but look at the performances. Supporters feel Newcastle lack creativity without suspended midfielder Jonjo Shelvey, who still has two games of his five-match ban to serve. Asked about the reaction to the Blackburn defeat, Benitez added: “The Championship is very difficult. “How difficult is it to get promoted? How difficult is it to go down and then come up again in the first year? “You see the other teams that were relegated. I think we are in a very good position. “Brighton are doing fantastic. But how much money have they spent in the last few years? “How many times have they been in the play-offs? Do they have experience in this league? Yes. “We are doing really well for a team that has been relegated and needs to change a lot of things like the mentality and a lot of things in the way we do business. Meanwhile, forward Ayoze Perez will miss the Birmingham cup tie with a calf injury.